Panel 1 of 3 shows a man exiting a partially-open door above which a sign reads: DATA CENTER. A woman stands nearby. Man: Big RAID array failure. 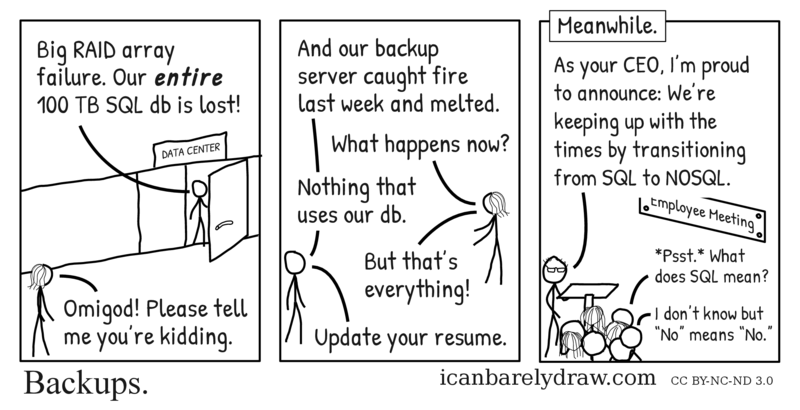 Our entire 100 TB SQL db is lost! Woman: Omigod! Please tell me you’re kidding. Panel 2 shows the same man and woman engaged in conversation. No other objects or background are seen in this panel. 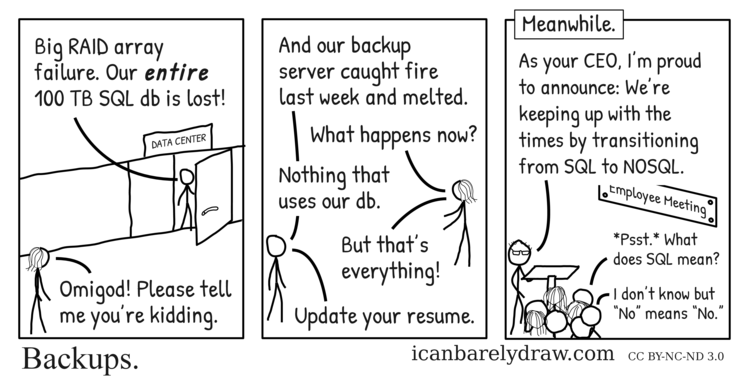 Man: And our backup server caught fire last week and melted. Man: Nothing that uses our db. Panel 3 shows a bespectacled man standing behind a lectern. An audience is in attendance. In the background a sign reads: Employee Meeting. Bespectacled man: As your CEO, I’m proud to announce: We’re keeping up with the times by transitioning from SQL to NOSQL. Man 1 in audience: *Psst. * What does SQL mean?